Many of you are wondering if a vegetarian or vegan diet might be appropriate for your animal friends. Fortunately, your dogs can be vegetarians! 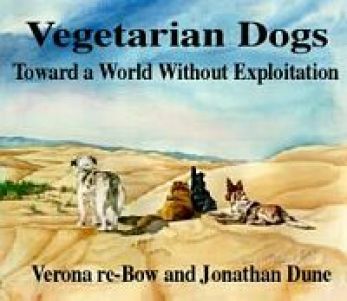 Vegetarian Dogs provides answers and gives directions to easily purchase (see resources) or prepare a healthy meal. The book will teach you about canine nutrition, ethics, exercise, and healthcare. Equally important, the relationship between dogs and people is nourished and enriched through the beautiful images and related stories. Some suggest more widespread benefits: "Dogs would benefit in health and temperament worldwide... Such a diet would also greatly reduce the risks of cancer, strokes, heart attacks, and other common diseases and disorders." - Michael W. Fox, D.V.M. Can dogs live healthy and active lives on vegetarian food? YES! We have fed numerous dogs a completely vegetarian diet (vegan) for 10 years. Furthermore, numerous studies cited throughout this book give support to this practice. Thus, since grains, vegetables, and cruelty-free supplements can meet all of a dog's needs, why not choose the diet that causes as little suffering as possible? This book will enable you to create healthy and delicious vegetarian meals for your canine friends. If you would rather purchase a commercial vegetarian dog food (see resources), you will gain confidence and the ability to discuss your choice with others. Proper nutrition is not related to a meat-based diet. The question of proper nutrition is not related to whether or not the diet contains animal products, but rather whether it contains sufficient amounts and proportions of a variety of nutrients. According to the National Research Council (NRC), 'Dogs require specific nutrients, not specific feedstuffs. "Research comparing the digestibility of meat and plant protein found that, 'No differences in protein digestion of cereal-based diets... were observed in this experiment.' Another researcher cites the digestibility of cooked starch 'in excess of 90%." Overall, there are no major obstacles to vegetarian dog food. Most people would agree that hurting others is wrong. However, many of us have neglected the simple rule: Do no harm. Even though we know, both from a scientific and a subjective point of view, that animals feel pain when we cage, dominate, and kill them, more than 6 billion animals live and die under horrible conditions every year in the U.S. Could it ever be right for a person to needlessly cause pain and death to another? Shouldn't we put the needs of others before our pleasures? This is especially true if it is our pleasure that directly causes their suffering. But even if one accepts that eating other animals is wrong for humans, does the same logic apply to dogs who eat other animals? Isn't it natural for dogs to eat meat? First, whether something is "natural" (presumably defined as arising without human intervention) has no bearing on whether it is good. For example, radiation, famine, and malaria are all "natural," but this does not make them personally desirable for us or our animal companions. Second, since it is unlikely that an animal possesses the ability to think, "Gee, I really shouldn't chase that cat because it isn't nice," a dog should not be held to an ethical standard. Therefore, it is not wrong for dogs to eat meat. But, is it right for humans to participate in the killing of other animals by feeding meat to their canine companions? To answer this question, we need only consider two issues: 1) Does raising and killing animals for food inflict suffering on others? and 2) Must we kill animals to feed our companion animals? If an activity is both cruel and unnecessary, then it is wrong. If the reader has any doubt about the answer to the first question, please read the books by Peter Singer and John Robbins listed on page 50. In Vegetarian Dogs, we assume that farm animals suffer greatly, both during life and at the moment of death. But do we need to kill animals to feed domestic dogs? Ten years of experience, scientific research, and the presence of certified commercial vegetarian foods all testify that killing to feed domestic canines is unnecessary. Thus, it fails both the cruelty test and the unnecessary test. Dogs (and humans) need protein, carbohydrates, fat, vitamins, and minerals. Too much or too little of any may cause problems such as obesity, malnourishment, or even vitamin or mineral toxicity. But don't panic! After all, you have been feeding yourself for many years without much thought. Dogs have many of the same requirements as people do, but may be more flexible in their ability to deal with some imbalances. It is important, however, that you have an understanding of where your needs differ from those of your animal friend. Dogs have a higher protein requirement than humans. One study demonstrated a minimum protein requirement of 6%. However, at this level, dogs were more prone to disease than at higher levels and the protein they received was carefully formulated to provide all their amino acid requirements. No optimum protein level is known. But no matter what quantity of protein is necessary (even over 30%), a vegetarian diet can meet t he standard with a variety of legumes or other foods. Vegetables are highly digestible by dogs after cooking. Baking is best for nutrient retention; but boiling is fine, if you also use the water in the food. Dogs love most cooked vegetables, but may prefer them cut into small pieces or pureed. Whole cooked potatoes make an excellent snack. Just fill a pan with potatoes and place in the oven for about an hour at 350 degrees. After cooling, store in the refrigerator and give as snacks. As much as 1/3 of the basic recipe can consist of "extra" vegetables without greatly altering the nutrient balance. Add up to one cooked cup per basic recipe. Beans, lentils and other legumes are especially high in minerals and protein. However, as mentioned earlier, you should check the dog(s) stool to see if they are digesting such foods. If you see whole beans, for example, cook them longer and/or put them in a blender. Add up to one avocado per basic recipe. This is an excellent source of essential fatty acids, among other important nutrients. The addition of one avocado will lower the protein requirement slightly to 15% (and increase the fat content). However, this amount is still greater than that suggested by one veterinarian. Add up to 1 cup dry or cooked pasta to the food. Any size shape or variety will do - it should be whole wheat or enriched, however. Dogs love bread. Fortunately, bread is a healthy snack. You can add it to the meal or use for treats. Although our first vegetarian dog recipe was used for years with no supplementation whatsoever, individual differences such as the local water supply, edible grasses, and other foods which our dogs may have found in the yard or on walks make it impossible to generalize these results to dogs everywhere. So, while there were no signs of acute deficiencies, we began supplementation based on scientific research and the AAFCO nutrient standards. We now supplement calcium, zinc, and vitamin B12. There are two other nutrients for which we are careful to include food sources: vitamin D from alfalfa, and betacarotene from carrots. Since dogs cannot choose their own food, you are solely responsible for the frequency and quality of their meals. Don't let them down. Puppies need three or more meals a day and adult dogs need two. Your dogs may prefer to be fed at the same time and place and in the same bowl each day. Leave the food out for one-half hour before putting it away. Do not put the food out before physical activity, as eating before exercise could cause gastric dilation/volvulus syndrome (GDV), a sometimes fatal condition occurring when normal food digestion is interrupted with physical activity. Finally, don't worry if your dog skips a meal or two, as such fluctuations are normal. On the other hand, don't try to limit your active dog's intake of healthy food. "...[O]besity is the most common disorder occurring in dogs." Perhaps as many as 1/2 to 2/3 of American dogs are obese. The effects of obesity are well established in humans and other animals: increase in heart and muscle diseases, decreased immunity, improper glucose metabolism and diabetes, as well as digestive problems, skin problems, and earlier death. Frequent brushing will ensure that their fur is beautiful. It will also remove irritating and allergic agents which may have been deposited from the air or ground. Walk your dogs every day, in nature if possible. Find a safe place to let them run off leash or begin running yourself so that you can explore the world with them. Dogs love to run beneath the sun and splash in streams and oceans. We must allow them this kinship with nature or they may develop problems such as hyperactivity, excessive chewing, barking, and digging, or other expressions of unhappiness. When such problems do arise, the dog is blamed and often abandoned on the street or in a shelter. With proper diet, exercise, and brushing, your dog should seldom need a bath, unless s/he rolls in something that is particularly disgusting to your senses. They are remarkably self-cleaning and, if healthy, their fur and breath should smell good most of the time. Most dogs enjoy sleeping inside the house, preferably on or next to your bed. Provide soft bedding on which they can lie. A large woven basket makes an excellent "den" in which they love to snuggle. The bedding should be shaken out and cleaned frequently to avoid fleas. You may wish to put diatomaceous earth on the bottom layers (away from their lungs) to kill fleas.